When we lived in Sydney, we were no more then a few minutes drive away from at least three cheaps takeaway pizza places. We also had the option of the more expensive "gourmet" pizza restaurant at the top of the street. So when cravings hit, crispy, cheesy, saucy pizza was top of the list. However, now we live in a cosy 'holiday village' that, while fantastic for it's proximity to beaches and nature, is a bit of a dud when it comes to satifying quick, cheap pizza cravings. A fifty minute round trip is not worth the effort, and sort of negates the idea of taking the lazy option. And while we do have a pizza restaurant in town, paying $24 for a thin and crispy is not always feasible. So, we bought ourselves a few pizza stones and now we make our own! Being a lazy friday night, and having a less then two week old oven that we are still testing = pizza for dinner. The dough recipe I use is very simple. 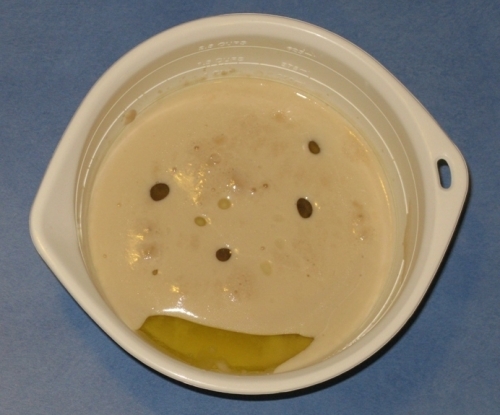 Into a small bowl, tip 7g of dry yeast. I buy yeast from the flour section of the supermarket in boxes of 12 sachets of 7g each. Add 1tsp of castor sugar, 2 tablespoons of oil and 3/4 cup of tepid water. This combo activates the yeast and feeds it as it rapidly divides and grows. It will be super foamy and have a distinctive smell. The carbon dioxide bubbles released by the yeast are what makes the pizza dough rise. Incorporate the wet mixture into 2 cups of plain flour sifted with 1 tsp of salt. The best flour to use is one high in gluten, which results in a stretchy doughy base. There are good flours available at the supermarket that are labelled as "Pizza or Bread" flour, go for one of those for best results. Bring the dough together on a flour dusted surface. Tension release time! 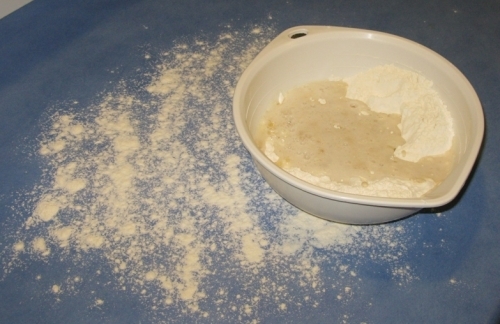 Knead the dough together, dusting with more flour if required to stop it sticking to the bench. Working the dough for a good few minutes will allow the gluten in the flour to become extra stretchy. The result should be a smooth dough ball. Put this ball into a bowl, cover with a tea towel and leave somewhere warm for half an hour to rise and double in size. After impatiently waiting all this time, take your aggression out on the dough by giving it a good punch in the centre to release some of the gas. Then tip it out onto a floured surface and roll out with a pin. This recipe makes one good pan pizza, or two thin and crispy. Sometimes we double the recipe and then spilt the dough ball into three to get that happy medium, but it's all personal preference. Place the base on a super hot preheated pizza stone, and top as desired. Our favourite pizza topping from our past haunt was not exactly traditional, but it is very, very tasty. 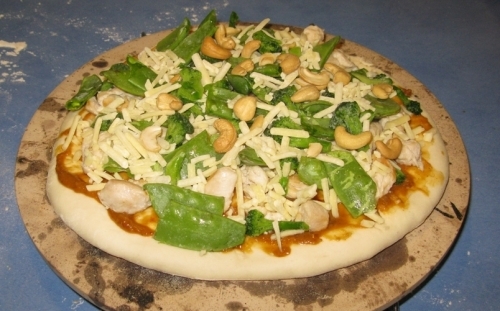 We start with a base of satay sauce, then add freshly browned chicken pieces, snow peas, broccoli and cashews. Then top the lot with a generous pile of cheese. As you can see from the photo, it is still early days working out what temperature we need to set the oven, it came out slightly crispy. But with even the most perfectly cooked pizzas, most people abandon the crust to avoid filling up and instead concentrate on the layers of cheesy crunchy topping in the center.